Haggadic midrash on Canticles, quoted by Rashi under the title "Midrash Shir ha-Shirim" (commentary on Cant. iv. 1, viii. 11). It is called also Agadat Ḥazita, from its initial word "Ḥazita" (R. Nathan, in the "'Aruk," s.v. ), or Midrash Ḥazita (Naḥmanides, commentary on Ex. iv. 28; Simon Duran, "Tashbaẓ," part iii., No. 37). SimonDuran, in quoting this midrash, says that it is a Palestinian haggadic collection (ib.). This undoubtedly correct view is supported by a number of circumstances. The sources which it uses directly are Palestinian. No direct borrowing from the Babylonian Talmud appears, and, although it contains many interpretations and comments found in this source, most of them vary greatly in form, the agreement being confined to their contents. This agreement, moreover, may be explained on the ground that the comments and interpretations in question are very old, and were included both in the Babylonian Talmud and in the Palestinian sources used by the redactor of the Shir ha-Shirim midrash (see below; comp. also Theodar, "Zur Composition der Agadischen Homilien," in "Monatsschrift," 1879, p. 343). The date of composition of this midrash can not be exactly determined. Canticles was interpreted haggadically at a very early time, and certain rules for this haggadic interpretation were formulated, as, for instance, the rule adopted by Judah ben Ila'i (Cant. R. i. 12, ii. 4) and the rule (in Sheb. 35b) for the interpretation of the name for Solomon used in Canticles. Upon these rules are based the interpretations of the verses of Canticles which are contained in the Seder 'Olam, in the Sifra, and, with especial frequency, in the Sifre and the Mekilta, as well as in the Talmud, which has an exegesis for almost every verse of the book. The majority of the interpretations in the last-named work were taken from public lectures on Canticles, or from various haggadah collections (comp. 'Er. 21b). Some scholars (Weiss, "Dor," iii. 263-264; and Jellinek, in a letter to Theodor, reprinted in "Monatsschrift," 1879, pp. 237 et seq. ), moreover, have assumed a direct connection between such ancient discourses and the present Canticles Rabbah, regarding this midrash as an old collection of these discourses, increased by various later additions. Jellinek thinks (l.c.) that there were several haggadic midrashim to Canticles, each of which interpreted the book differently, one referring it to the exodus from Egypt, another to the revelations on Mt. Sinai, and a third to the Tabernacle or the Temple; and that all these midrashim were then combined into one work, which, with various additions, forms the present Shir ha-Shirim Rabbah. This midrash is, according to Jellinek, older than the Pesiḳta de-Rab Kahana, which, he holds, has borrowed entire passages from it. Theodor has shown, however, that it was composed at a later date than the Pesiḳta de-Rab Kahana, from which it has borrowed entire passages. The author of Shir ha-Shirim Rabbah, intending to compile a running midrash on Canticles, took the comments on the several verses from the sources which he had at hand, and the changes and transpositions which he made are similar to those made by the redactor of the Yalḳuṭ; in fact the midrash is similar in many ways to a yalḳuṭ. This method of redaction explains the great difference in the length and the character of the several comments; and it explains also the fact that the same comments are repeated two or three times for the same or similar verses. 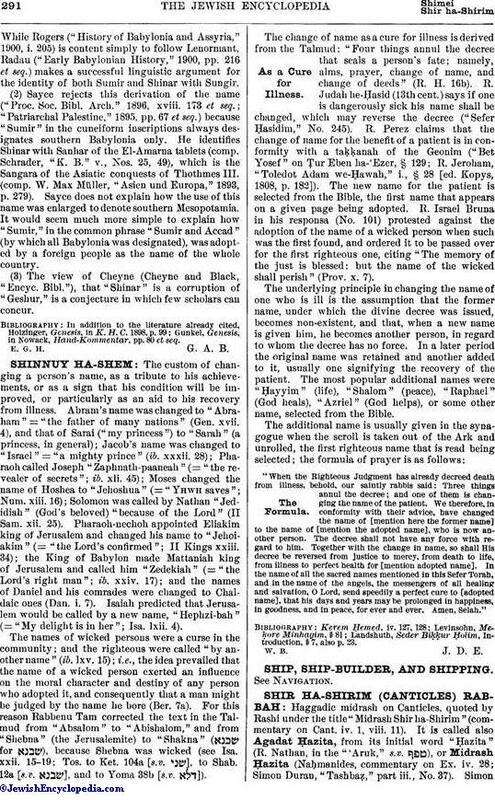 Besides the Jerusalem Talmud (which was the chief source) and the Pesiḳta de-Rab Kahana, the direct sources used by the redactor are Genesis Rabbah and Leviticus Rabbah. The material borrowed from these sources constitutes a large part of the midrash; and it throws a light also on the redactor's method. The remainder of the midrash must have originated in midrashic collections which are no longer extant, and from which the redactor borrowed all the comments that are found also in the Seder 'Olam, the Sifra, the Sifre, and the Mekilta, since it is not probable that he borrowed from these earlier midrashim. The midrash is older than Pesiḳta Rabbati, since the latter borrowed passages directly from it. As the Pesiḳta Rabbati was composed about 845 C.E., Shir ha-Shirim Rabbah must have been composed about the end of the eighth century. 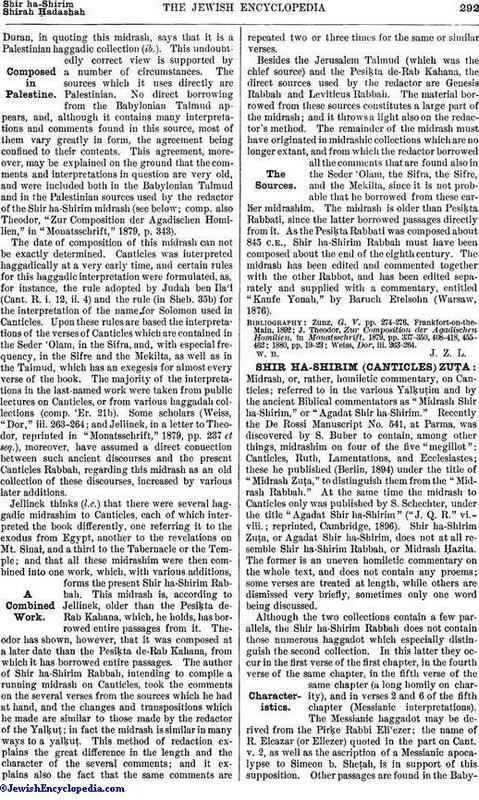 The midrash has been edited and commented together with the other Rabbot, and has been edited separately and supplied with a commentary, entitled "Kanfe Yonah," by Baruch Etelsohn (Warsaw, 1876).